and establishing the science of epidemiology. than from asphyxiation or heat. didn’t see or taste anything funny. the water would kill them. to the specters we fear. all calculate their risks in ignorance. it is our reality—haunting us. are and continue to suffer. are as necessary as love and experience. how to put the handles back on. In 1854, the causes of disease were not known. Responsible people maintained contradictory opinions. Most believed that diseases were caused by bad smells or “miasmas,” poisonous gases containing particles from decomposed matter or “miasmata.” Supporters of the miasma theory had supporting evidence, because removing bad smells by improving sanitation diminished the problem. Others, the contagionists, believed that diseases were caused by physical contact. Lastly, some believed that germs caused disease, and germs could be spread by contact or by drinking contaminated water. 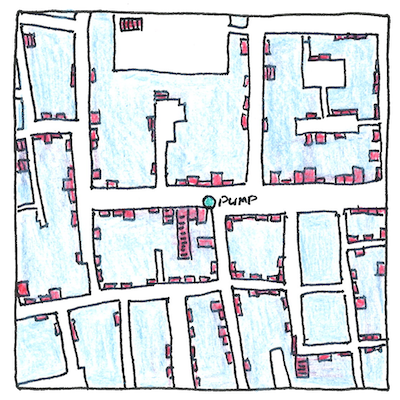 John Snow’s map showing clusters of cholera cases in the Soho neighborhood of London disproved the miasma theory.